This lovely photo montage captures what my parents shared w/me and my siblings through stories, song and traditions about life on the island in the '40s. It's quite emotional for those of us of the Great Migration. Also, I suspect many of our fellow Latino migrants--especially today's abused immigrant workers--can relate as well. Even the harshest Republican governors on the US mainland aren't pushing for the mass firing of govt workers, but the one in Puerto Rico is. Gov Luis Fortuño has already fired 20,000 govt workers, including 7300 school teachers, and plans to fire another 10,000. This is on top of an island economy that leads the nation in unemployment and that shed 41,000 private sector jobs in the past year alone. PR's unemployment rate now stands 17.5% -- again, by far the highest in the US and 2nd only to the Dominican Republic in the Caribbean. Oh, and the PR rate doesn't account for the under-employed nor for those who have given up hope of employment. It's likely that 50- 60-70% of the island's workers are NOT gainfully employed—and prospects for such are exceedingly slim given the government’s boneheaded policies. It's under this scenario that Fortuño's reckless firings, combined w/a military-style crackdown on protestors that's pushing PR over the edge. Though his response is not new...making life so miserable for workers that they migrate to the mainland is a well honed govt. strategy. 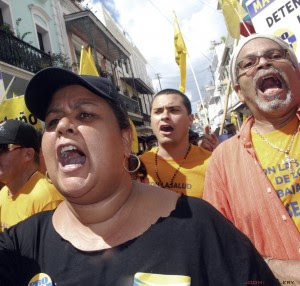 Seriously, it's the classic San Juan approach to solving labor and economic challenges. Watch tomorrow's island-wide strike. PR's future may very well depend on what the workers and the govt choose to do. 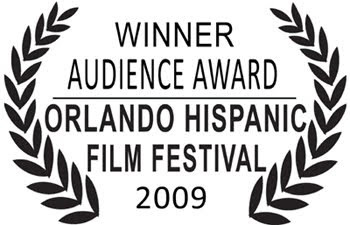 Producers of THE BORINQUENEERS today announced that their film has won the 2009 Orlando Hispanic Film Festival Audience Award. Special thanks went to 65th veterans: SFC German Bravo (Ret.) and Raul Reyes Castañeira (both participated in the program), CSM Jose Amalbert (Ret. ), Andres Medina and Igrail Morales; Carlos Guffain (65th vet LTC Tomas Guffain’s son), and the Orlando chapter of the Borinqueneers Motorcycle Club. 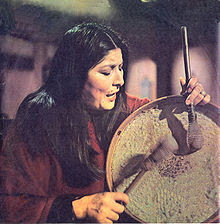 Argentine folk singer Mercedes Sosa, the "voice of Latin America" whose music inspired opponents of South America's brutal military regimes and led to her forced exile in Europe, died today. She was 74. Watch the video for a glimpse into what made 'La Negra' beloved by the people and hated by the powerful. Who is Latino? is a question on the minds of many. Watch 'Emigrante Latino' by the Salvadorean group 'Los Hermanos Flores', and if you're not deeply moved by the music, images and the words, you're NOT Latino. If you have Latin American family heritage--in whole or in part--and you feel deep empathy, a connection, to the people in the song, then you ARE Latino.